Candidates eagerly waiting for the TGC 128 Cutoff Marks and SSB Dates (commencing in JAN 2019 at Indian Military Academy (IMA), Dehradun). 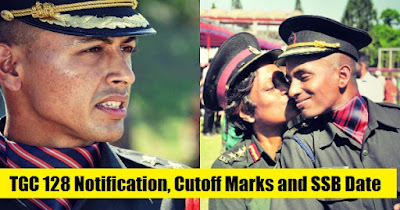 entries have a good news that it has been declared officially the direct entries dates on the official website of Indian Army.All the candidates are requested to read the official notification and carefully fill the application form.Technical Graduate Course or TGC 128 is an entry through which engineering graduates (only Male) can join the Indian Army.This entry is for Permanent Commission in the Army. Engineering graduates can apply for it. The next entry in this line will be TGC-128 entry. TGC is a direct entry scheme for SSB candidates who are eligible and interested to join Indian army can read the full notification and apply online.For any details or queries ask below in comments. Post name: Technical Graduate Course (TGC) (commencing in JAN 2019 at Indian Military Academy (IMA), Dehradun). Candidates should be between 20 and 27 years as of first day of month in which course is due to commence. (Candidates born between 02 Jan 92 and 01 Jan 99, both dates inclusive). 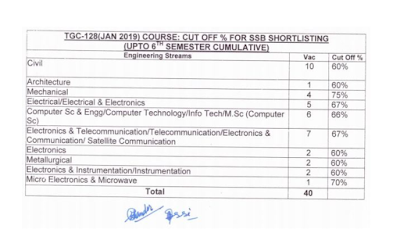 BE / B Tech final appearing & degree holders in notified streams of Engineers from recognized university. Candidates can checkout the expected cutoff marks for TGC 128 and compare from previous year cutoff . Click on ‘Officer Entry Apply/Login’ and then click ‘Registration’. Fill the online registration form after reading the instructions carefully. Then you will find a Page‘Application Form’ will open. Read the instructions carefully and click ‘Continue’ to fill details as required under various segments. 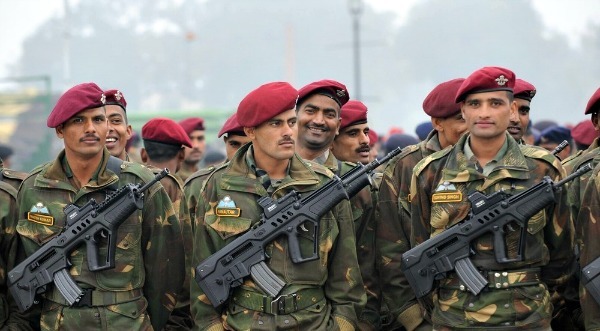 Personal information, Communication details, Education details and details of previous SSB. At the end you will find 'Summary of your information' do Check all the details are correctly filled by you Your name, surname, date of birth because once submitted it cannot be changed so carefully check all the details. Click on Submit button and click on PDF and take two PDF copies having system generated roll no and keep it safe for SSB interviews. Once you are recommended by SSB board you will have to wait for 4-5 days for your medicals where you will be examined by the Medical Officers and if you are found Fit you will be marked as FIT or else given TR which is temporary rejection where you will be given 45 days of extension for another medicals. After medicals, before a month of your course to begin All India Merit list would be generated and uploaded on the official website and according to the vacancies and your performance you will be ranked. If you find your name in Merit list soon you will get call letter to reach Indian Military Academy (IMA), Dehradun for your training's. Aspirants are requested to keep visiting our page for more details regarding TGC 128 Notification, Cutoff Marks and SSB Date soon we would upload with cutoff for TGC 128 once its announced officially so candidates are requested to keep visiting our page for updates. for any doubts or details regarding TGC 128 Notification, Cutoff Marks and SSB Dates comments are welcomed.Also like our official Facebook page for latest updates. 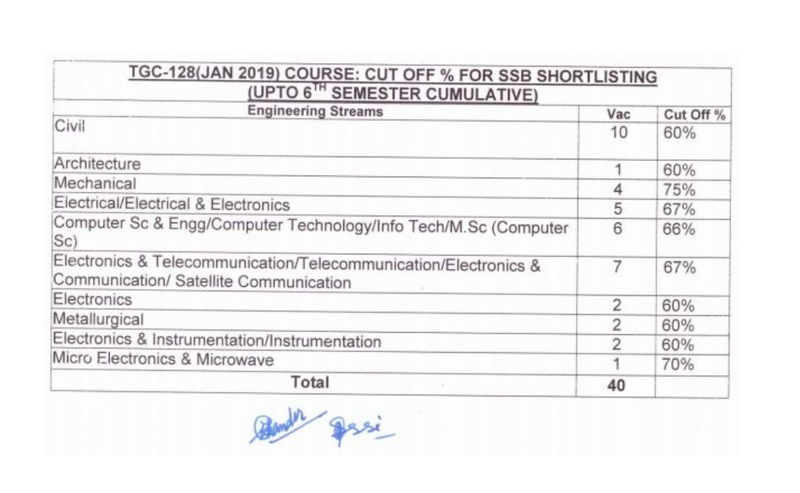 In case a candidate comes under cut off till 6th semester but does not qualify the cut off upto 8th semester. Then how things are to be done by candidate?